The flatworms belong to a phylum of invertebrates known as Platyhelminthes. There are about 10,000 species of flatworms, which are called simple worms as they have no respiratory system or brain. They are found throughout the world in both aquatic and terrestrial environments. Some varieties are parasitic although they can go undetected and cause their host little harm. The adult flatworm is around 40-65 mm long and 4-7 mm wide from the head to the tail. They also have a flattened cross section that is less than 2mm thick. The color of the flatworm is a very dark brown and the stomach with a thin pale line. The back of the flatworm is a pale gray. They all have flattened bodies that are shaped like broad leaves. The flatworm is basically a layer of tissue that has a muscular, reproductive, and water and salt regulating systems. The flatworm moves by the means of two layers of muscles in its body wall and cilia which they have thousands of them. The cilium covers the belly of the flatworm. A flatworm searches for food with a flexible tube that is formed as the throat pushes out of the mouth. When the flatworm is done searching for food the throat is pulled back inside the mouth. The flatworm's excretion of food is out of its mouth. A flatworm has a simple nervous system with two nerve cords that runs down the sides of the worm. The worm also has a simple brain called ganglia. The flatworm has two eyespots that can only sense light. Flatworms spend most of their time searching for food. If food is not available, flatworms die or go dormant. 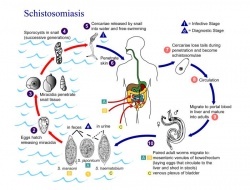 Life cycle of schistosomiasis parasite. Flatworms have both male and female reproductive body parts. They are able to produce both sperm and eggs, making them Hermaphrodites. Flatworms are able to fertilize themselves, which is a form an asexual reproduction. 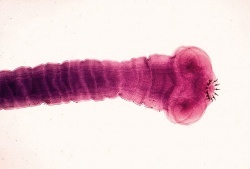 They are also able to reproduce sexually with other worms, but most commonly they are asexual. They are able to produce millions of eggs in a day. These eggs are found in the rear section of the tape worm. When the eggs are ready to leave the body, they break off and are excreted with digested food. The eggs will remain in the feces until another animal swallows it. The eggs cannot survive very long outside a host's body, so if they are not swallowed by another animal they will die. Flatworms are native to New Guinea but the have been introduced into Guam, Hawaii, Philippines, Northern Mariana Islands, Australia, Palau, Japan, Maldives, Tonga and Vanuatu. Most of these places are third world countries. Flatworms are also found where sanitary conditions are very low and standards for disposal are not high, or in China and other oriental countries where human wastes are used as fertilizer and food is eaten raw. They are found in cows, chickens, cats, dogs, and other domestic animals. Flatworms adapt to any new host without causing a lot of harm to their hosts. There are two stages of flatworms; there is the adult flatworm and the larva. The host of the adult is called the main host and the host of the larvae is the alternate host. This page was last modified on 26 July 2014, at 11:22.